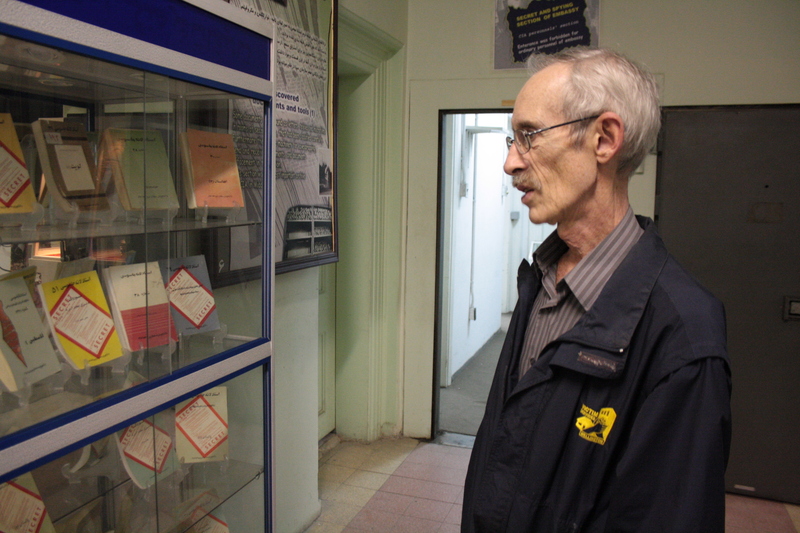 The highlight to any trip to Tehran—if you can manage it—is a visit to the scene of the most spectacular hostage-taking in recent history, the US embassy, which Iranian students stormed in November 1979, holding 52 Americans hostage for 444 days, and dumping US diplomatic correspondence on the street in a spectacular premodern WikiLeak. For Canadians and Brits, getting there is not easy. Neither country has diplomatic relations with Iran at present. Canadians must mail their passports to the Pakistani Embassy in Washington, DC, Brits must apply to the Omani Embassy in London. (Britain and Iran have only recently agreed to open consular services following a meeting between Iranian President Hassan Rouhani and British Prime Minister David Cameron at the UN in New York in September 2014). As a Canadian, visiting the Nest of Spies is no easy job—Canadians must get their visas from the Iran Interest Section of the Pakistan Embassy in Washington, DC. Like most Iranians, my guide Shadan, a gentle and cultured journalist speaking fluent American English, is eager to see relations with the US restored. “It is still US property,” she asserted. “In Islam, we respect private property and we want peaceful relations with the US.” The embassy building is a long, low two-story brick building, similar to American high schools built in the 1930s, and nicknamed “Henderson High” by the embassy staff, referring to the ambassador appointed by President Truman in 1951. The original furnishings—now much the worse for wear—include clunky 1970s state-of-the-art electronic ‘computers’ and electronic devices used to encrypt messages and send them to US plotters around the world, now forlornly gathering dust. The “glass room” shows mannequins of agents sitting enclosed entirely in glass to allow them absolute secrecy. One must proceed through thick safe-like doors kept sealed by mighty Yale locks. No Madam Tussauds could dream up a more eerie exhibit. On display are up to 20 volumes of documents seized by the "Muslim Student Followers of the Imam’s Line" (including painstakingly reconstructed shredded documents) in a series called “Documents from the US Espionage Den”. These books included telegrams, correspondence, and reports from the US Department of State and CIA, some of which remain classified to this day. Westerners can see a Hollywood re-enactment of the early days of the hostage-taking, "Argo", the wildly popular but very inaccurate docudrama, winner of 2012 Best Picture Oscar, depicting the escape of six US diplomats in the early stages of the siege. Then-Canadian ambassador Kenneth Taylor hid the Americans who had scaled the rear embassy wall, made it to a safe house during the 1979 hostage crisis, and were issued Canadian passports. In addition to Canada’s cloak-and-dagger role during the siege, the visit is made especially piquant because of the “conspiracy” surrounding the Stephen Harper’s decision to cut all diplomatic relations with Iran in 2012. Harper’s personal crusade to demonize Iran reached a bizarre high/low point when Minister of Foreign Affairs John Baird announced the severing of relations with Iran in 2012 just hours before "Argo" premiered at the Toronto International Film Festival. “Life imitates art” takes on new meaning. The siege of the US embassy was actually the second one following the January 1979 revolution in Iran. An earlier one by leftist students in February had ended when the Iranian government secured the embassy for the Americans after three days. However, by November, the revolution was in the hands of Ayatollah Khomeini’s followers, and he was now de facto head of the government. The occupying students demanded the return of the Shah for trial and the Ayatollah could hardly tell them to get lost. The Canadian rescue operation itself was initiated at great personal risk by the Ambassador Taylor and Canadian immigration officer John Sheardown, who provided sanctuary in their own private residences for the six Americans. Then Canadian Secretary of State for External Affairs Flora MacDonald and Prime Minister Joe Clark issued an Order in Council to forge the passports (plus one for CIA disguise and exfiltration expert Tony Mendez), and the CIA provided the fake visas. "Argo"’s hero Mendez proceeded to Tehran as a Canadian film producer, joined his compatriots at the Canadian ambassador’s residence, and they were soon left for Switzerland aboard the appropriately named Aargau airplane, ending the hostages’ six-week ordeal. A last-minute glitch—the CIA had the wrong visa dates, apparently unaware that Iran uses its Islamic calendar—was overcome by an alert Canadian official. The Tehran embassy had indeed been a ‘nest of spies’, as the Shah was the most reliable US ally in the Muslim world, along with Turkey’s Kemal Ataturk the only Muslim leader who recognized Israel, and it was only natural that the CIA made the US embassy in Tehran ‘mission control centre’ for all US espionage activity in the Muslim world. Officially, the US has since admitted that there were at least three bona fide CIA agents among the captives. The six diplomats rescued by Taylor were consular workers, so they probably were not CIA agents. 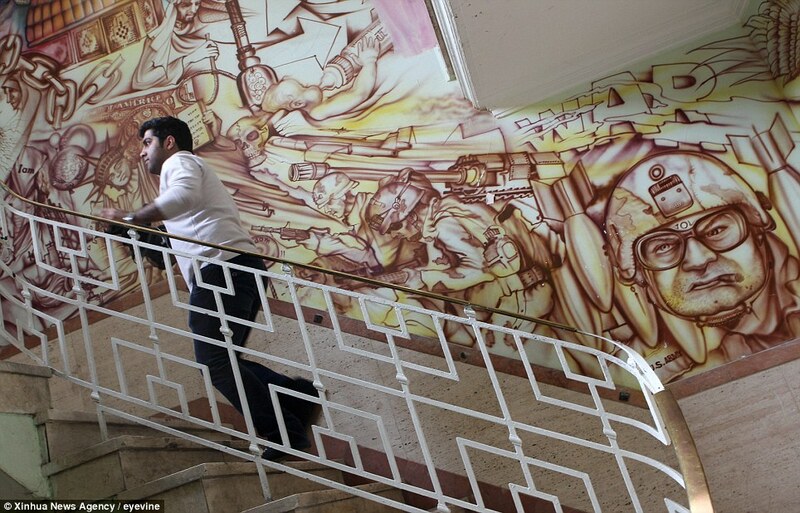 The Iranian students representatives insist they did not torture any of the hostages, and, declaring their solidarity with other “oppressed minorities” and “the special place of women in Islam,” freed 13 women and two African-American guards two weeks into the siege, and later a man suffering from multiple sclerosis. None of the women hostages complained of sexual harassment. But following his unsuccessful escape attempt, hostage Bill Belk said he was beaten and publicly humiliated, put in solitary confinement and had his hands bound for weeks. The students arranged for a Christian minister to provide religious services. Photos in the museum show Iranian cooks preparing a turkey Christmas dinner for the hostages, and two women and the guards relaxed and laughing. A photo of one of the guards showed him with an imam, and he publicly thanked Ayatollah Khomeini for allowing him to go free. A touch of the Stockholm Syndrome? No money changed hands as a result of the siege, and there were no American casualties, except for eight Marines who died when their helicopter crashed in the Iranian desert in Carter’s first bungled rescue attempt in April 1980. The 52 hostages were flown to Algeria January 20 1981, 20 minutes after Reagan concluded his inaugural address, the first move in what came to be known as the Iran-Contra affair. Reagan’s foreign policy team had secretly agreed to exchange arms-for-hostages with the Iranians, now at war with Iraq. Since 1979, the United States government has officially had no dealings with the Iranian government, and is represented in Iran by the United States Interests Section of the Embassy of Switzerland in Tehran. 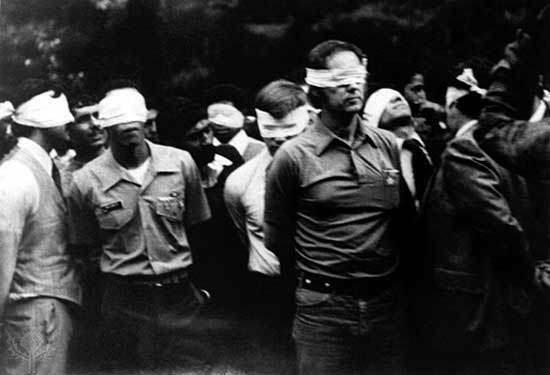 This is belied by the hostage crisis itself, as Reagan swore his oath of allegiance in 1980, resulting in their release, and by the subsequent Iran-Contra Affair, when Reagan authorized selling arms to Iran to fight Saddam Hussein (who of course also received US arms and much more to fight the Iranians), funneling the proceeds to the Nicaraguan contras in Reagan’s own personal jihad against the socialist Sandinista government. With reality this bizarre, who needs fiction? The visit to the embassy was bittersweet. Clearly Iranians are now of two minds about this time warp into their anguished past. The museum is generally closed, and visits require special arrangements for both foreigners and Iranians. Iranians uniformly want to restore relations with the US. Yes, in the siege, the US was reaping the fruits of decades of imperialist intrigues, notably its involvement in the overthrow of the Iranian Prime Minister Mohammad Mossadegh in 1953 and the reinstalling of the Shah, who kowtowed to the US and Israel, and presided over a ruthless and unpopular dictatorship, turning Iranians against the US. At the same time, Carter, who lost the 1980 election to the trigger-happy Reagan primarily due to the hostage crisis, was America’s most liberal president, now revered as a humanitarian. Reagan’s foreign policies were far more militaristic, leading to Bush and the invasions of Afghanistan and Iraq, hardly policies that were favorable to Iran. The US in the 1970s after Watergate and Vietnam was at its least aggressive, seemingly ready to make some kind of peace with the world. 1975 witnessed the Soyuz-Apollo space mission with the Soviet Union, and Carter signed major disarmament agreements with the Soviet Union. The year 1979 brought an end to this, with upheavals in both Iran and next door in Afghanistan, and we can only look back on 1978 with nostalgia. As the nearby muezzin called Iranians to prayer, we climbed into the van to brave Tehran’s traffic. Shadan told me wistfully how much she had loved studying at the American School just down the street in the 1970s. “Everything I learned in school is thanks to Mrs McNeal, my English and History teacher at the American School. She was dedicated and made learning fun. We were a truly multinational group. America in the 70s was at its zenith. It’s been downhill ever since,” she sadly concluded.